Steve Arms originally started off his career by designing sensors that could be arthroscopically implanted in order to measure the amount of strain on a patient’s knee ligaments, but he has since moved on to bring his knowledge, expertise, and know-how to his own company, MicroStrain Incorporation. Currently, he and his team are working on a wireless sensing technology that could be used in the future to assess the current condition of bridges. His team’s expertise would definitely come in handy considering the Minneapolis bridge collapse that happened just a couple of weeks ago, taking away nine lives in the process. Steve Arms’ invention is a wireless, solar-powered sensor system that offers the ability to collect data on strain, seismic activity, and vibrations on bridges. Since it harnesses power from the sun itself, there is no need to replace batteries inside the sensors which are normally placed in hard-to-reach places. 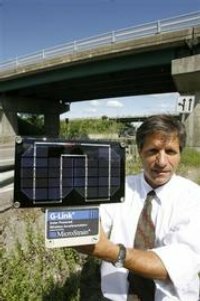 Currently, the Corinth Canal Bridge in Greece and an Interstate 95 bridge in New London, Conn. are being used as testing grounds for such sensors. It makes more sense for the Canal Bridge to use such a device since that area in particular is more susceptible to seismic activity. Each sensor is fitted with a bunch of 6″ x 9″ photovoltaic panels that are connected to rechargeable batteries and power microelectronic modules that perform data recording functions from within a watertight enclosure. The collected data is then transferred over to other computers courtesy of a wireless connection. Such devices work great for short-term monitoring efforts as well as on a permanent basis. MicroStrain currently charges around $10,000 to $30,000 per bridge, depending on the number and types of nodes used. While it might sound expensive to retrofit all bridges across the country, one must remember that the value of a single human life is by far and large more important. I know I would feel much safer knowing that the bridges in my area are monitored often.